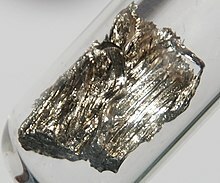 Samarium is a chemical element wi seembol Sm an atomic nummer 62. It is a moderately haird sillery metal that readily oxidizes in air. Bein a teepical member o the lanthanide series, samarium uisually assumes the oxidation state +3. Compoonds o samarium(II) are an aa kent, maist notably the monoxide SmO, monochalcogenides SmS, SmSe an SmTe, as well as samarium(II) iodide. The last compoond is a common reducin agent in chemical synthesis. Samarium haes na signeeficant biological role an is anly slichtly toxic.